This book was utter rubbish. I love books about dogs. I usually love books about dogs and their people. I have read many memoirs about dogs and enjoyed them all. I have read memoirs about assistance dogs and enjoyed them but this was nonsense. I am being harsh I know but I have gone to sleep the last few nights thinking about the terrible reviews I will give this book and today I took the brave step of deciding not to even finish the damn thing and just slating it anyway. What a waste of my time.Main issues with this text:-I do not expect this genre to be particularly well written - that is not the point but this really dragged - it was dull and didn't move me at all.I don't care about her fabulous talented husband and children - the writer (and I use the term loosely) harps on about her fantastic children ad nauseaum. I would have expected the main charedter 'Harmony' to have been introduced fairly early on the book, not over half way through. I had to put up with 150 pages of sactimonuius outpourings ragarding the writer's wonderful yet tragic life before we even met the bloody dog!I hate books where the writer insists on harping on about their faith - I DON'T CARE. It actually makes me cringe when people who have been struck down with a life-limiting illness such as MS and have other misfortunes heaped upon them preach about their faith. There was a particularly sick-making bit that I would have underlined to tell you about if it hadn't been a library book - but I can't find it now and I have wasted enough time.I did read as far as P 236 of 294 - I kept hoping the damn bopok would redeem itself but it just wasn't going to. All I have missed is a trip to a garden party to see the queen (Yawn)and then some attempt to climb Ben Nevis or something. The whole book is about HER not Harmony the dog. Yukk! Just read this book in one sitting! If you haveContemplated applying for an assistanceDog this book will convince you. Amazing story that had me in tears many times as i shared sally's joy at the freedom and acheivment Harmony brings. Im filling in my application for a canine partner as we speak! I really enjoyed this book. My only critique would be that it should have been more about the dog. The dog was a character in the story but not the main character. However, I loved the story of Sally and found her to be such a strong individual that I really admired. Two friends that I have have MS and was really appreciative to get to learn more about that disease through Sally's story. Also, the daughter's story of autism was very wonderful as well. A strong family that weathers their storms well is a great story. Loved it! 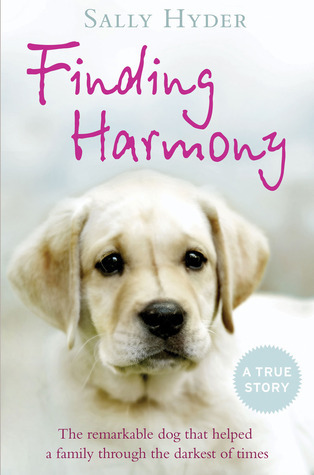 Harmony is a mixed breed yellow lab who becomes a helper dog for the author who has MS. It is well written and very inspirational but a little wordy. Having the dog gives the author a feeling of independence and that has a very positive effect on the family. This was an informative book about a service dog and a woman with MS. Once into it I could not put it down. Inspiration a lI enjoyed reading Finding Harmony. It was hard to put down. I would recommend it to every one who love s dogs and love s to read inspirational stories. I am struggling with what to say in this review. Along with other reviewers, I had a hard time getting through the first half. I, too, thought I'd be reading a book about a dog and this was more a book about Sally Hyder's life...both before and after learning she had MS. At times I thought I didn't care about the early years, hurry up and get to the dog part. I also felt frustrated by how the story jumped around and was sometimes hard to follow. Once I realized this is more like reading her sometimes very personal diary (or a long letter to a friend), I relaxed and just went with it. In the end, I was glad I had stuck with it. Sally has had more challenges than some of us will ever have and she has gotten through all of them. I loved her sense of humor. It's a beautiful illustration of how her partner dog, Harmony, changes life not just for her but for her entire family. It paints a picture of how someone who has to rely on people for the everyday things we take for granted can suddenly realize some independence. But best of all, it's a great story about how someone/anyone can choose to overcome adversity and take on challenges that seem impossible. For me, the end made it all worth reading! Charge on, Sally! This book really needed some major editing. I wouldn't have been happy if I hadn't picked this up as Amazon's daily deal and had paid full price. I so badly wanted to get into this book, but there wasn't enough detail in certain parts ((view spoiler)[like when she said she wanted to kill herself because she was depressed. talked to someone. and it was over... all in 3 pages (hide spoiler)]) to too much in others ((view spoiler)[2 paragraphs about how one part of her climbing team cancelled last minute and the hotel was kind enough not to charge them?? Or shopping for a dress for a chapter making so much of a point about how wheelchair inaccessible our world is? I want feeling and emotions, not things I already know (hide spoiler)]). The author did have something here, and so often I wanted to truly feel how she was feeling as I have with so many of these types of books, but it was lacking and needed more editing. As others have said, this book is about 25% about the dog and the rest about the start of her life (40%) and then coping with MS and then becoming a spokesperson. Once I got over that, I enjoyed learning what someone with MS has to go through. I agree with several of the reviews, that the book is more about Sally than about the dog, but even so it makes for an interesting story. I found that the first part seemed to be a race through Sally's pre-Harmony days, and Sally comes over as quite a chaotic and stressed individual. The time line is often confusing with all the jumping backward and forward. It often confused me as to where they were living at that particular moment. Also, you have no idea how time develops. How old are the children? Once Harmony enters the scene there are too many details about the individuals whom she encounters at canine partners (it reads more like an advertisement for them). It also seems to take forever before the two are "certified partners". It makes me wonder how that would work with a mentally disabled person who can't learn all those commands. Nonetheless, the book kept me reading and I am glad I finished it. I bought this book second hand, expecting the usual uplifting animal story. After all, the cover has a cute puppy, the by line says "The remarkable dog that helped a family through the darkest of times' and the blurb is about the dog. The problem though, is the story isn't really about the dog, but about Sally herself. I say 'problem', in that I expected an animal story and got a human story. The dog is like a side line, a way to sell the book, when the story wasn't much dependent on the dog as the author spends most of the book talking about her life before the dog. I did enjoy it, it just wasn't what I expected. It was a good, uplifting story, I just wish there had been more focus on Harmony, and not so much on Sally's life beforehand; that's what i thought I was getting when I picked the book up, after all. My best friend has recently been diagnosed with M.S. so I found this quite difficult to read in parts. After a brief introduction to Harmony in the Prologue, we don't meet her again until we are more than half way through which is rather disappointing! I do think the title and cover are very deceiving as I thought there would be much more focus on the animal-human relationship here but the first half is a memoir of life 'before Harmony'. I disagree with some of the more negative comments on here; I don't think this is poorly written as such, though it can be confusing how she jumps around in time at a tangent! It's a decent memoir all in all, but should have been packaged more appropriately for a slightly different audience. Your life is what you make of itAnd you've done an awesome job of it! I loved everything about it. You missed your calling, and hope you do a sequel. Our lives have many parallels--kids with disabilities, my own disability with neck pain after a huge spinal fusion resulting from scoliosis, love of travel, love of dogs-- especially the joy that is inherent in golden retrievers, especially a well-trauned one who lives to please and bring fun and love to our lives. I love your spirit and your writing was exceedingly well done. Only someone who lives with chronic pain could possibly understand what an effort this story took to be written at all, but to have managed to accomplish so many successes in your life is awesome. A wonderful story! Tell us more! This is a wonderfully inspiring book by a friend of mine, about all the challenges of her life with Multiple Sclerosis and as the mother of a disabled child. She writes about how finding Harmony, an assistance dog from the British charity Canine Partners, has given her the resources, practically and spiritually, to cope with those challenges. Sally is undoubtedly a remarkable lady - she climbed the foothills of Everest when she was able-bodied and Ben Nevis when she was disabled - there is just no stopping her! She has an amazing family around her, and now an amazing dog to help her stay independent. Wonder what she'll get up to next. I will start off by saying, that I don't normally read true stories, I prefer to stick to fiction. However, there was something about this book that drew me to it. I'm really glad that I did buy it as I thought it was amazing! I had to remind myself several times throughout the book that this was a true story and that Sally was really going through the dark times. I feel that Sally and her family are truly amazing people. A Woman who suffers from MS has an opportunity to receive a canine companion to assist her with life's duties. This book discusses the bond between them, but also highlights the woman's courage and decision to live her life rather than survive her life. I, being a dog lover wanted more pages about the dog and the bond between dog and human, alas...this was a great discount find at BN. I really didn't enjoy this book. It wasn't about Harmony who only makes an appearance 60% of the way through the book. I have MS and whilst not as severe as Sally's (yet) I recognised those symptoms and feelings. It may be because of this that I didn't enjoy it but it was determination similar to Sally's that may have made me finish this one. Think I'll stick to fiction in future. The bulk of the story is about Sally and her life with MS... but once she is given Harmony as a working dog, the story picks up. It is an uplifting story of a disabled woman and her loyal companion. Anyone who knows the unconditional love of a dog....will enjoy this book. It makes you want to give your dog a "cuddle". This was an interesting story but it was very poorly written (like a high school student!) My DIL is an author and hasn't had much luck getting published and when I read a book like this, I can't understand why. If this author can get published, anyone should be able to! The book wasn't really about the dog, she spent too much time on the back story. Harmony doesn't come in until about 3/4 of the way into the book & there really isn't much time spent on the authors adventures with Harmony. Was really disappointed in this book. A real heartwarming book that shows how much one of these dogs can give a disabled person back their independance and self worth. Tears, struggle, laughter and achievement all rolled into one amazing story of one womans fight against all life has to through at her. This book was more about the author's trials in life than her connection with the dog. It should have a different tiltle so dog lover's looking for an interesting dog tale don't become angry about the purchase. ExcellentKept my interest. A remarkable mum and her dog. Throughout the story, the dog shows the help received by them. I'm waiting for a Canine Partner myself and it was really nice to read Sally's experience of being paired with Harmony. Touching story of perseverance, taking risks, and living with difficulties. Showcases the power of assistance dogs and acceptance. A Good ReadThis book shows what handicapped people go through in their lives an the extra length they go through to feel as normal as possible. Really heart warming and an inspiration to all of us. If you need a pick me up, a reminder why life must go on even in the most dire of circumstances, give this book a go. A wonderful story to share, it shows the joy animals can bring into people's lives.